The Building Urban Resilience in Southeast Asia project, funded by the European Commission’s Humanitarian Aid Department (ECHO), supports Red Cross Movement partners in Cambodia, Lao, Viet Nam and the Philippines to build the capacities of National Societies, government, school teachers and children, Red Cross youth and volunteers, and partners, through a coherent, regional strategy drawing on good practice and innovation. The action emphasizes gender equity and social inclusion of poor, vulnerable people, including people with disabilities and older people. The IFRC, in partnership with Finnish, German and Spanish Red Cross societies, brings to the project extensive experience in school safety, public awareness and public education, and risk mapping, with strength in peer support and learning. Knowledge, Attitude and Practice (KAP) Baseline Survey activity is aimed at determining baseline data to develop project activities and to be comparative with the endline survey at the end of project to measure an improvement of the knowledge/awareness and behaviors of people in the communities. Public awareness and public education for disaster reduction seeks to turn available human knowledge into specific local actions to reduce disaster risks. It mobilizes people through clear messages, supported with detailed information. Hazard awareness alone does not lead directly to people adopting risk-reduction measures. Documentation of the recommendations to build on DRR in Southeast Asia, which includes priority actions, advocacy messages and strategies to enhance the investment in DRR in the region. Around 50 participants from various agencies, governments and National Societies took part in the workshop. Three case studies on School Safety, PAPE and QGIS have been published and ready to be shared with participants attending the Regional Lessons Learned Workshop as well as national and local levels for cross learning. KAP consultant conducted interview and group discussion with BUR volunteers. 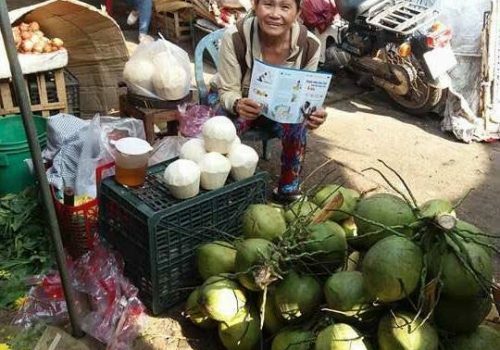 Result 2- Innovative PAPE for disaster risk reduction, targeting specific vulnerable group brings about positive, safer behaviour, improved preparedness and social change in five wards of Vientiane. The Knowledge, Attitude and Practice end-line survey was conducted in five target communities during November 2017. On the 4th and 5th November 2017, students from 2 schools (Nasaiythong school and Donnoun school) have been trained on data collection of the KAP survey in order to practice and review questionnaires before going to the field. The sample site was selected of every unit of village through the list of resident record totaling 348 households, which consists of 54 households from Chanthabuly, 36 households from Sikhodtabong, 50 households from Nasaiythong, 164 households from Donnoun and 32 households from Bo-Oh village. Volunteers and village office staff have been interviewed by KAP consultant in the field. The result of the KAP End-line Survey will be reported in November. During the last week of November, the Lao RC DM Team distributed some equipment to five schools to enable them to mitigate identified risks such as fire, mosquito borne diseases, flooding. The assistance consists of some tools for water clogging clearance, garbage cleaning and fire extinguishers. Result 2- Innovative PAPE for disaster risk reduction, targeting specific vulnerable group brings about positive, safer behaviour, improved preparedness and social change in five wards of Quy Nhon City. End of October, the end line KAP survey was conducted in the five project wards and in November the first results were compiled. The results demonstrate that the Behavior Change Communication Campaign meet its objectives. 65% of the targeted population known/ have heard of the campaign. The results show that when the respondents were asked what they would do in case of fire, 37% have quoted five safer behaviors and stated they have started to adopt those behaviors or would adopt them in case of fire. The behaviors listed by the respondents are (i) staying calm in case of fire (37%), (ii) turning off electric devises (46%), (iii) alerting other (63%), (iv) evacuating safely (45%) and (v) extinguishing fire with available materials (44%). Moreover, almost 80% of the population know the correct number to call Fire fighters (they were only 50% at the beginning of the project) and they know the basic information to provide when calling them. The results also show that the population have adopted (or plan to adopt) the appropriate behaviours for providing first aid to persons affected by fire: for instance, 60% of the respondents answered that they have wrapped or will wrap a person who catch fire with clothe/ cover to kill off the fire, and 81% of the respondents answered that they have or will put the burned limbs of the person under water for 20 minutes. Result 3- Increased capacity of local government authorities and Red Cross for disaster preparedness and response in five wards of Quy Nhon City, Binh Dinh. The key achievement is the finalization of the QGIS Multi-Hazard risk Mapping Methodology based on the feedbacks gathered from the three piloting countries (Cambodia, Philippines and Vietnam). DANA Training: A Damage and Need Assessment training was organized in Quy Nhon city from 30 October to 2 November involving 33 persons from the Committees for Natural Disaster Prevention and Control and Search and Rescue (CNDPC&SR) from province, city and ward levels (21 persons, 6F,15M) and the VNRC Provincial Disaster Response Team (13 persons, 3F, 10M). The training was facilitated by two experienced VNRC experts in DANA and 01 staff from the provincial CNDPC&SR and 01 Technical support group at ward level trained in the new QGIS mapping methodology. The participants built their capacity in conducting a Damages and Needs assessment as per VNRC standard and have learned how QGIS risk mapping could contribute to the preparation and reporting phases of the assessment. PEER CADRE Training: Two PEER CADRE trainings (Program for Enhancement of Emergency Response -Community Action for Disaster Response) were organized in in Nhon Phu and Ghenh Rang wards from 11 to 13 and from 17 to 19 of November involving 2 persons from the city authority and 44 members (13F,31M) of the ward Emergency response Teams. The trainings provided the participants with technical knowledge, demonstrations and practical applications of 03 key skills for emergency response: (1) securing families and preparing for response, (2) Organizing and managing Incident Command System and Triage, (3) Search and Rescue. The trainings also highlighted the added value of QGIS maps for supporting efficient Emergency Response. Additional QGIS training: an additional training on the new QGIS Multi-Hazard risk Mapping Methodology was organized on the 16-18 Nov involving 32persons (5F,27M) from 16 wards and communes of Binh Dinh Province and 4 persons (2F,2M) from City CNDPC & SC. This additional training was requested by the Province CNDPC&SR in support to a Provincial programme which aims that by 2020 70% of the commune/wards will have develop their Disaster Response Plans. The training was facilitated by 01 staff from the provincial CNDPC&SR and 01 Technical Support Group (TSG) member from the targeted ward. At the end of the training 90% of the participants have increased their skills in QGIS mapping and have acquired the basic skills to develop multi-Hazard risk maps in their own ward/commune. A Lessons Learned Workshop was organized in Quy Nhon on the 21th of November. The main objectives were to share experiences on (i) the application of QGIS participatory multi-hazard risk mapping methodology for Disaster Prevention and Control planning in Urban Context and (ii) on effective behaviour change communication processes. More specifically, 21 Provincial level staffs (4F, 17M), 3 city level staffs (1F,2M) and 23 ward level authorities (8F,15M) have learned from the project experiences in using the new mapping methodology and have exchanged feedbacks and perspectives upon this new methodology. The workshop also explored how this new methodology will be scaled up at Provincial level. The maps of the five targeted wards were officially handed over to the Provincial standing committee of Natural Disaster Prevention and Control and Search and Rescue. The workshop was co-facilitated by the VNRC /GRC with the contribution of Quy Nhon wards authorities and TSGs who had used the new methodology. Official handing over of QGIS maps and methodology to Mr Phan Xuan Hai- Chief of office of Binh Dinh CNDPC & SC . Mr Phan will hold additional trainings to replicate QGIS methodology to 11 remaining districts of Binh Dinh Province with the purpose of developing a DRR map of the whole Binh Dinh province by end 2018. National Workshop on Urban DRR- 27th of November- Hanoi: On the 27th of Nov, 75 DRR practitioners from the provincial CNDPC&SR and VNRC chapters from 16 disaster prone provinces, the Disaster Management Policy and Technology Centre (DMPTC), the Vietnam Disaster Management Agency (VNDMA), PNS, IFRC, VNRC HQ, INGOs, mass organizations, UNDP, University, and national media (VTV1) attended this event. The morning sessions aimed at sharing the experiences on the application of QGIS participatory multi-hazard risk mapping methodology for Disaster Prevention and Control planning in Urban Context. The participants have learned from the experiences in using the new mapping methodology in Quy Nhon city and have exchanged feedbacks and perspectives upon this new methodology. The workshop also explored how this new methodology will contribute to the National CBDRM Programme and to its revision. The workshop was co-facilitated by the director of the DMPTC, VNRC and GRC with the contribution of Quy Nhon wards authorities and Technical Support Group who had used the new methodology. Madame An, vice President of the VNRC and Mr. Dang Quang Minh acting director of CBDRM department under VNDMA attended the morning sessions and expressed their interest in the replication and scaling up of the methodology. The methodology and the maps developed in the five wards were handed-over to the VMDMA and DMPTC and will be uploaded on the DMPTC’s VinAWARE data base. The afternoon session aimed at sharing experiences on effective behaviour change communication processes. The session was co-facilitated by the VNRC and GRC with the contribution of lecturer in Behavior Change Communication (BCC) from RMIT University.In October, the Disaster Preparedness Plan and the QGIS maps of each ward have been tested through drill exercises. Each ward organized its drill (5 in total) based on a flood and storm scenario and involving 200-250 persons from local community, authorities, volunteers and Red Cross. The fire brigades also participated as the scenario included a fire in an at-risk household. Thus, it was an opportunity to further promote the safer behaviours of the communication campaign. Throughout this month, a clear progress has been made towards the completion of key activities of the Project as the VCA reports, the cross visit to Valenzuela City and the PAPE campaign. At the same time, on November 9, ECHO visited Brgy Tatalon and Carlos L Albert High School. Particular emphasis has been placed in showing the main accomplishments of the project, by presenting a simulation table exercise together with the VCA Action Plans. Result 1: Children and youth are more resilient to disasters and have a safe and secure learning environment in 8 urban public schools in The Philippines, through improved Red Cross contributions to the ASEAN Safe School Initiative (ASSI). 1.3.4 Conduct endline survey in 8 schools. District IV had started implementing the endline survey using ODK. The aim of the endline survey was to assess the knowledge, attitude and behavior of school children in relation to Disaster Risk Reduction and Management taking into consideration the three pillars of the Comprehensive School Safety Framework and in line with the ASEAN Safe School Initiative (ASSI). Each school assigned 15 focal students who were previously oriented and supervised by 3 RCY and 1 staff. District II will start the endline survey by December 2017. 1.4.1 Conduct (or update) a comprehensive Vulnerability and Capacity Assessment through a participatory approach. Batasan Hills National HS is already finished with the VCA report, and is currently being supervised by Quezon city Chapter. KAP Endline Survey using ODK in Betty-go Belmonte Elementary School held last November 20, 2017. 1.5.2 Identifying and setting up school early warning system. Early Warning Systems are still under procurement process. 1.5.3 Provision of first aid kits and minor equipment for training, drills, and simulation exercises. The First Aid kits and the equipment were finally distributed last November 29, 2017 in Pres. Corazon C. Aquino ES, Batasan Hills Elementary School, Bagong Silangan HS and Bagong Silangan ES. The project has introduced a monitoring and control system that will be validated during the exit strategy workshop in December 2017. 1.2.8 Set-up School DRRM Teams and provide further specialized training such as DRR, CCA, health and hygiene promotion, child protection, gender and diversity. Throughout this month, specialized training was conducted at Bagong Silangan Elementary School on Nov 30 and Oct 3, attended by 108 teaching and non-teaching personnel (92 female and 16 male). Topics discussed were Disaster Management, Psychosocial Support and Fire Management. Speakers were invited from PRC and Bureau of Fire. Result 2 – Innovative PAPE for disaster risk reduction, targeting specific vulnerable group brings about positive, safer behaviour, improved preparedness and social change in 15 at – risk urban and pre – urban areas in four countries. 2.2.2 Development, reproduction, and distribution of innovative and inclusive PAPE and IEC materials. In District II, Barangay Batasan Hills has finalized the video screening for youth while Barangay Bagong Silangan promoted DRR orientations and flyer handout at school and community level. 2.2.3 Conduct KAP end line survey using ODK. Conducted KAP end-line survey in District IV last November 27-30, 2017. The survey will be completed by the end of December 2017 in both districts. 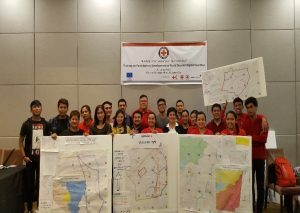 Result 3 – Increased capacity of local government authorities and Red Cross for disaster preparedness and response in 4 barangays in Quezon City, the Philippines. 3.2.1 Participatory development of risk maps involving representatives on local people, including vulnerable groups, government authorities, and PRC staff. Barangay Batasan Hills ´s risk map was already uploaded while Barangays Bagong Silangan is still on process. Some information related to infrastructures and capacities are pending. For Batasan Hills and Bagong Silangan data collection was finalized late this month. 3.5.1 Conduct (or update) a comprehensive Vulnerability and Capacity Assessment through a participatory approach. Bagong Silangan and Batasan Hills completed the VCA reports. Both are under revision of Philippines Red Cross (NHQ). 3.6.2 Carry out research study to select an area with a successful urban DRR model within the country and organize a study visit on November 10, 2017, to Valenzuela City, in order to share knowledge, experiences and good practices related to recovery facilities. 5 representatives of Barangays Doña Imelda, Tatalon, Batasan Hills and Bagong silangan attended together with 15 chapter staff and volunteers (total number of participants: 35 -24 male 11 female). Seek action on how to apply best practices in their own Barangays. 3.7.6 Provision of first aids and minor equipment for training, drills, and simulation exercises. The First Aid kits and the equipment were distributed last November 2, 2017 in Brgy. Tatalon and November 3, 2017 in Brgy. Doña Imelda. The Chapter Administrator of Quezon City Chapter, Ms. Amparo Perez, was present in the ceremony. Batasan Hills and Bagong Silangan will distribute the First Aid Kits by December 2017. Save the date for the workshop was sent out early October to relevant partners. For further details about the workshop refer to the link. Final draft of three case studies on School Safety, PAPE and QGIS have received significant contributions and inputs from partner national societies and ready to be shared with ECHO for feedback and comments. It is expected that all three case studies will be published late November before the regional lessons learned workshop. On 14-15 October 2017, Community Campaign was conducted in four communities including Nasaiythong village and Sidamduan village on 14 October 2017 Sithan neua village and Donnoun village stared on 15 October 2017. The campaign was led by trained students (Lao Red Cross volunteers), village staff, LRC staffs. The campaign was conducted through door to door visit, parade in some markets and group focus discussion supported by some awareness raising materials such as comics of 7 disasters, posters (hygiene, disaster and climate change), hand fan 6 disaster (flood, hygiene, road safety, drought, storm and climate change). It is estimated that the campaign has reached at least 1,963 people (1,088 female). In October, the campaign on four behaviours related to the risks of fire in households came to an end. The Facebook page which was setup in July by and for young people as the main mean to inform the young audience about the campaign has been very successful. At end of October, the Facebook page counted more than 100,000 reach posts (= number of people the Facebook posts were served to), and more than 38,000 persons have been directly reached from which 63% are from Binh Dinh Province, 36% from the rest of Vietnam (Hanoi, Ho Chi Minh), 1% from abroad. The contents of the page include key messages and illustrations on the four behaviors, short reports, interviews, and live broadcasts of all the campaign events. The large majority of the people reached are between 18 and 24 years old (85%), 43% are women and 57% men. The short movie contest launched in September also came to its end in October. A movie developed by youths from Quy Nhon was selected and uploaded on the Facebook page to showcase the four key behaviors that the campaign promoted. This is one of the illustration about the participatory approach used by this project to encourage peer to peer awareness building and promotion of safer behaviours. Mr Phan Dang Khoa – Chairman of Thi Nai ward People’s Committee and Head of the Natural Disaster Prevention Committee – coordinating a drill exercise using QGIS multi-hazard map (17 October 2017). Photo by German Red Cross. On the 25 and 26th of October 35 students and ward authorities staff have been trained in conducting a KAP survey. This training facilitated by GRC included practical sessions to test the questionnaire and the sampling methodology. Then the trained enumerators conducted the survey in the five project wards. More than 800 respondents were selected randomly through a strict methodology: about 400 women and 400 men from which about 50% are aged between 18 and 60 years old and 50% are over 60 years old. This will allow the comparison of answers in order to evaluate the campaign impacts for each gender and age group. The results of the KAP survey will be documented in November. In October, the Disaster Preparedness Plan and the QGIS maps of each ward have been tested through drill exercises. Each ward organized its drill (5 in total) based on a flood and storm scenario and involving 200-250 persons from local community, authorities, volunteers and Red Cross. The fire brigades also participated as the scenario included a fire in an at-risk household. Thus, it was an opportunity to further promote the safer behaviours of the communication campaign. 1.2.7 Conduct orientation sessions with teachers and students in Diosdado P. Macapagal ES (Barangay Tatalon) in YADAPT participated by 90 co-teachers (81 female and 9 male). 1.2.8 Set-up School DRRM Teams and provide further specialized training such as DRR, CCA, health and hygiene promotion, child protection, gender and diversity. This month, specialized training was conducted in one of the project schools: Bagong Silangan Elementary School on Nov 30 and Oct 3. Attendees: 108 teaching and non-teaching personnel (92 female and 16 male). Topics discussed were Disaster Management, Psychosocial Support and Fire Management. Speakers were invited from PRC and Bureau of Fire. 1.4.1 Conduct (or update) a comprehensive Vulnerability and Capacity Assessment through a participatory approach. This month, Bagong Silangan ES, Pres. Corazon C. Aquino ES and Bagong Silangan HS have completed the VCA reports, the documents are currently under revision of PRC (NHQ). Whereas, Batasan Hills National HS is in 1st revision at Chapter level while Carlos L. Albert High school submitted to Division Office. 1.6.1 Distribution of updated IEC materials. Second batch of IEC materials are waiting for delivery in Quezon City Chapter. Y-Adapt re-echo session at Diosdado Macapagal ES (barangay Tatalon) on October 28, 2017. Attendees: 91 participants (84 female ad 7 male). This activity was facilitated by one of the focal teachers. 1.7.1 Identify small mitigation based on SDRRM Plan and conduct technical assessment; Coordinate with stakeholders for support/co-funding. Proposals are being finalized by the schools. Procurement process is ongoing. 2.2.2 Development, reproduction, and distribution of innovative and inclusive PAPE and IEC materials. Barangay Batasan Hills has implemented some of the activities on PAPE campaign, which started early this month. Doña Imelda and Tatalon completed the tools for PAPE campaign in a form of video presentation to be conducted in 7 consecutive activities in the coming month. 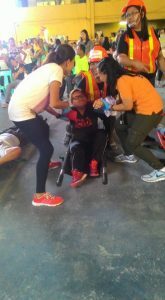 In Barangay Tatalon, only one activity was conducted on October 12 for elderly and people living with disability. The collected recommendations will be used for the coming activities. 3.2.1 Participatory development of risk maps involving representatives on local people, including vulnerable groups, government authorities, and PRC staff. Presently, 3 maps had been completed: Brgy Tatalon (Fire), Brgy Tatalon (Flood), Brgy Doña Imelda (Flood), with the last 2 maps tested through simulation last October 27. Brgy Tatalon and Doña Imelda final versions are ready for printing. Barangays Batasan Hills and Bagong Silangan are still in the process of plotting the collected information on their risk analysis, infrastructures and capacities. 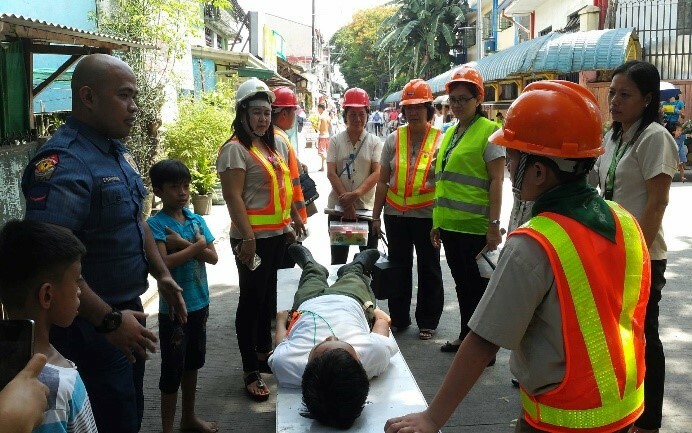 3.3.1 Conduct simulation exercise (table-top or live drill) including participants from government authorities, PRC staff and volunteers, and target different vulnerable groups. Successfully completed the tablet-top simulation exercise of Flood Risk Maps of Brgy. Doña Imelda and Tatalon participated by different stakeholders with a total of 30 participants (22 males and 8 females). 3.6.2 Carry out research study to select an area with a successful urban DRR model within the country and organize a study visit. 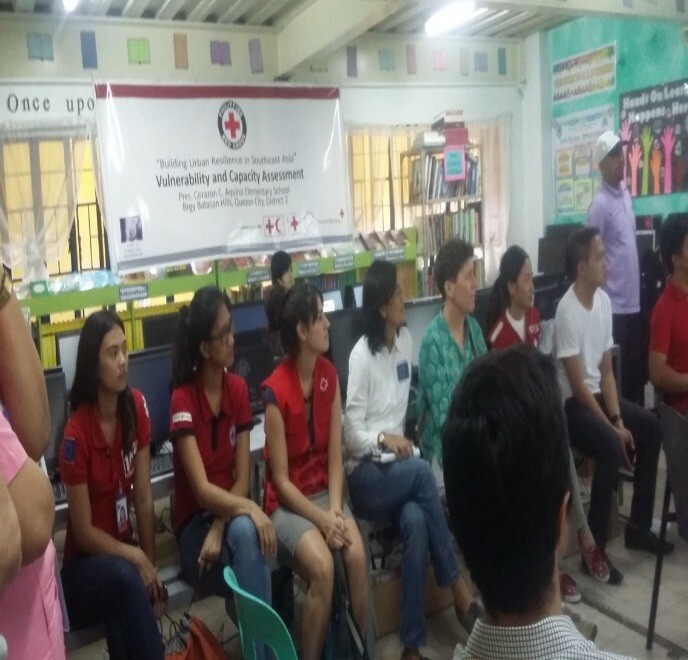 On October 27, a learning cross visit to Barangay Santo Cristo (Quezon City) and Barangay 176 Bagong Silang (Caloocan City) was conducted, as suggested by the Office Civil Defense (OCD) and Philippines Red Cross. The activity was attended by 24 participants from each barangay together with PRC. 3.7.6 Provision of first aids and minor equipment for training, drills, and simulation exercises. Later this month, First Aid kits were distributed to the District IV: Brgy. Doña Imelda on 28 October and Brgy. Tatalon on 30 October. A review of the project budget was finalized at the end of October 2017, as there was an extension of the project, and the full project team by 1 month. CCA Training for sub-branch officers. This training included the participation of CRC sub-branches from other districts in Bantey Meanchey (not only the capital district). This is seen as a means to contribute to the overall capacity of the CRC Bantey Meanchey Branch. Workshop to conclude the drafting of the the District Emergency Preparedness and Response Plan, together with local authorities: PCDM, DCDM, CRC Branch, etc. Preparation of school fire evacuation plans together with Bantey Meanchey Police Department (responsible for fire safety). The plans were finalized in 2 of the 3 schools; with the last one pending preparation. Continuation of dissemination of key DRR messages in schools and communities; focusing on flood awareness, drought, and first aid. Finalization of community risk maps in 6 communities/villages belong to the two target Sangkats. Continuation of implementation of small scale mitigation measures in schools; and preparation for implementation of community mitigation measures. Most of these measures relate to water and sanitation practices as a means for community resilience and preparedness for emergencies. A mock-up of the case study has been consulted with partner national societies and ECHO for inputs and feedback. In addition, two other case studies on innovative and participatory risk mapping and school safety have been drafted and shared among partners for further inputs. It is expected that all three case studies will be finalized early November for publication before the regional lessons learned workshop. Lao Red Cross received an ECHO auditor team who spent three days (20-22 September) in Laos to visit to three schools of Nasaiythong, Donnoun and Vientiane. The visit attended by the project targeted students and teachers who have been trained and part of the project since its onset. The auditors had chance to listen to student presentation sharing their knowledge on disaster and training they participated in. The students also shared their school disaster risk reduction plans and hazard/risk mapping to the visitors. The first PAPE campaign was conducted in Bo-Oh Village on 23 and 24 September with the aim to disseminate key messages of disaster (flood, storm and road safety) to over 100 households in the community level. The campaign was led by 17 students (LRC volunteers), 1 village staff, 1 IFRC staff and 2 DM staffs. 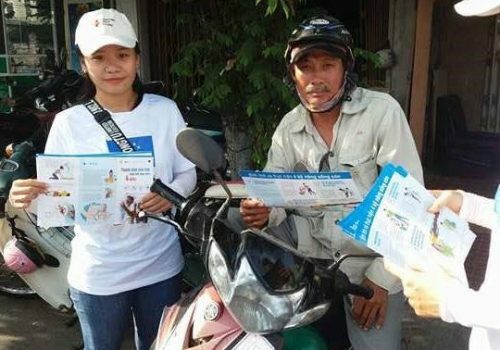 The campaign was conducted through door to door visit and group focus discussion supported by some IEC materials such as comics of 7 disasters, posters (on hygiene, disaster and climate change), and hand fan of 6 disaster (flood, hygiene, road safety, drought, storm and climate change). It is estimated that the campaign has reached at least 525 people (274 female). 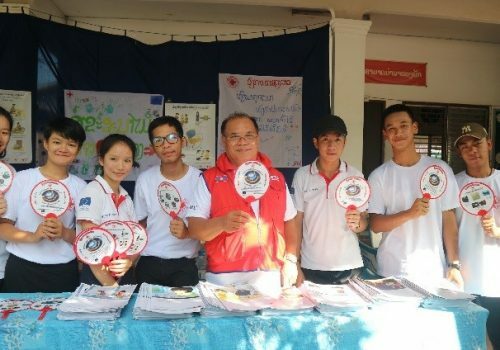 On 29 September, a joint event was organized with the Lao RC Health department to celebrate the World First Aid day in Chanthabuly school, Chanthabuly district, Vientiane Capital city. During the event, approximately 200 students participated together with Lao RC staffs, school teachers and other partners. There were 24 students to support the First Aid booth and disaster risk reduction booth during the event in order to share knowledge and information that they have learnt from building urban resilience project through posters, handmade banners, comic and hand fans in the booth, also had a quiz activities on disaster booth to let participants learn and share knowledge on disaster. the Facebook page which was setup in July (https://www.facebook.com/dapluaantoan/) has reached around 80,000 people mainly from the Binh Dinh province. The Facebook page displays illustrations on four key behaviors: (i) being able to appropriately extinguish fire in households, (ii) being able to perform appropriately first aid for dealing with burned skins, (iii) calling the right number (and providing the fire brigade with right information when calling), and (iv) evacuating when there is fire. The contents of the Facebook page are developed by youth volunteers from the five target wards of Quy Nhon city with the support of one young representative from the VNRC chapter, and one student volunteer from the RMIT University from the Communication department in Hanoi. The content includes key messages on the four behaviours, short reports and interviews of all the campaign events taking place in Quy Nhon and live broadcasts of those events. In September, a short movie contest has also been launched on the Facebook page. Individuals and groups of youths are invited to develop short movie to illustrate the four key behaviors that the campaign promote. This is one of the illustration about the participatory approach used by this project to encourage peer to peer awareness building and promotion of safer behaviors. All the project wards have finished the communication events that they have planned. This included knowledge contests on Fire Safety and theatre plays. The fire brigade and the ward and hamlet authorities were actively involved in each event to judge the theatre performances and distribute prices to the contest participants (families and youth). In parallel, Key messages on Fire Safety were broadcast through wards’ loudspeakers radio programmes reaching potentially the entire population of the five wards. Moreover, as in Thị Nại ward in August, Hai Cang and Thi Nai have also set up mobile loudspeaker teams with 25 cyclists for each team including youngsters and elderly persons. The messages conveyed by those mobile teams are similar than those shared via loudspeakers and this aimed at ensuring that most of the population has been reached. The distribution in the five wards of 20,000 leaflets with illustrations of four behaviours, and the setting up of 8 billboards in key public spaces also ensured the campaign outreach. In September, the five wards have finalized their Disaster Preparedness and Response plans using the QGIS maps and database developed with the new DPR mapping methodology. Those plans have been approved by the ward authorities. Based on this achievement, the city and province authorities have expressed their willingness to replicate the approach in other city wards. Thus, the new mapping methodology has demonstrated its relevance for enhancing local government capacity in Disaster Preparedness and Response (DPR). Using a free software, the methodology is adapted to staffs with limited computer skills and the DPR maps provides georeferenced and easy to understand information to local authorities and people. Data base also list down the most vulnerable groups so this provides an excellent foundation for developing realistic and actionable DPR plan. In September, feedbacks on the methodology has also been gathered from the three implementing countries (Cambodia, Philippines, Vietnam). Those feedbacks will be used in October and November to finalize the DPR mapping methodology. Efforts have focused on the provision of further specialized trainings mainly related to disaster management, psychosocial support and fire management, together with two significant workshops on Participatory Approach for Safe Shelter Awareness (PASSA) Youth and Youth Action on Developing Plans for Tomorrow (Y-ADAPT). Furthermore, it has been taking the first steps towards the completion of the cross visits and exchange experiences within the Philippines, as six (6) different areas had been visited. 1.2.5 Red Cross Youth formation and orientation and Leadership Development Program (LDP): On September 23 & 24, 2017, another Leadership Development Program was conducted in Badging Silangan High School in coordination with the Red Cross Youth department. It was attended by 105 participants (28 male and 77 female). 1.2.7 Conduct re-echo sessions with other teachers and students: Later this month, the installation of DRR Corner Bulletin Boards for four schools were completed as well as distribution of materials to be used. 1.2.8 Set-up School DRRM Teams and provide further specialized training such as DRR, CCA, health and hygiene promotion, child protection, gender and diversity, etc. Bagong Silangan High School (on September 16 & 17, 2017) attended by 87 teaching and non-teaching personnel (26 male and 61 female). Batasan Hills National HS (on September 23 & 24, 2017) attended by 132 teaching and non-teaching personnel (25 male and 107 female). The main topics discussed were disaster management, psychosocial support and fire management. Speakers were invited from PRC and Bureau of Fire. 1.4.1 Conduct a comprehensive Vulnerability and Capacity Assessment (VCA): The VCA for Bagong Silangan ES (Brgy. Bagong Silangan), Pres. Corazon C. Aquino ES (Brgy. Batasan Hills), and Bagong Silangan HS (Brgy. Bagong Silangan) are currently being reviewed at NHQ (PRC) and all of them are at an advanced stage of revision. 1.5.2 Identifying and setting up school early warning system: The total amount for the implementation of the Early Warning System had been increased (from Php 40.000 to Php 80,000). Bagong Silangan ES w/ HS, Pax: total population of both schools have participated in the drill on September 13, 2017. Activity: Lifesaving exhibit through recycled materials, Pax: 400 people participated in the activity, on September 27, 2017. Activity: Y-ADAPT Training, Pax: 1 focal teacher and 1 focal student from different schools with a total of 32 participants (10 male and 22 female) had participated, on September 4 – 6, 2017. This YADAPT initiative aimed to increase awareness and sharing experiences among school population towards climate change by taking concrete actions. 1.7.1 Identify small mitigation based on SDRRM Plan and conduct technical assessment; Coordinate with stakeholders for support/co-funding: Proposals are being finalized by the schools. City Engineering is working on the Programs of Works of each project. 2.2.2 Development, reproduction, and distribution of innovative and inclusive PAPE and IEC materials: Different activities related to PAPE campaign had been implemented later this month. The latest activity was on September 23, 2017 in Barangay Batasan Hills, which saw the participation of more than 84 people. This activity was implemented in coordination with barangay personnel and volunteers. On September 19-21, 2017, the Participatory Approach for Safe Shelter Awareness (PASSA) Youth Training was held with 4 youth representatives from the 4 barangays. There was a total participation of 30 persons (14 males and 17 female). The goal of PASSA training is to develop local capacity to reduce shelter-related risk by raising awareness and developing skills in joint analysis, learning and decision-making at community level. Result 3 – Increased capacity of local government authorities and Red Cross for disaster preparedness and response in 4 Brgys in Quezon City. 3.2.1 Participatory development of risk maps involving representatives on local people, including vulnerable groups, government authorities, and PRC staff. The barangays Batasan Hills and Bagong Silangan are currently in the process of plotting the collected information regarding their risk analysis, infrastructures and capacities. Barangay Tatalon and Doña Imelda are ready for final revision of the table-top activity. 3.5.1 Conduct (or update) a comprehensive VCA through a participatory approach: The barangays Tatalon, Doña Imelda, Bagong Silangan and Batasan Hills are on the process of completing the step 5 (reporting). 3.6.2 Carry out research study to select an area with a successful urban DRR model within the country and organize a study visit: Later this month, a visit was conducted to potential barangays, suggested by the Office Civil Defense (the implementing arm of the National Disaster Risk Reduction and Management Council and Philippines Red Cross, to be considered for the cross visit and experience exchange in relation to DRR good practices that can been replicated to the project barangays. Implementation of PAPE campaign at community level (fire prevention) through radio messages/radio shows. At Regional Level: Regional Forum on “Demystifying of the Global Agenda Frameworks into Practice” took place from 29-30 August 2017 in Bangkok, Thailand. The 2-day Forum aims to identify the challenges, linkages, and potential key entry points for integrating the Sendai Framework for Disaster Risk Reduction, the Sustainable Development Goals, Paris Agreement on Climate Change Adaptation, and the World Humanitarian Summit towards achieving a common goal of making communities resilient to disaster and climate risks in the Asia-Pacific region. For further details, refer to the link. A mock-up of the case study has been prepared and consulted with partner national societies for inputs and feedback on the design, a fine-tune version will be available in September for further consultation with ECHO. In conjunction with the case study development, a Troika discussion was conducted among IFRC CCST, German RC and ADPC on the possibility of complementing and overlapping each other during the process. 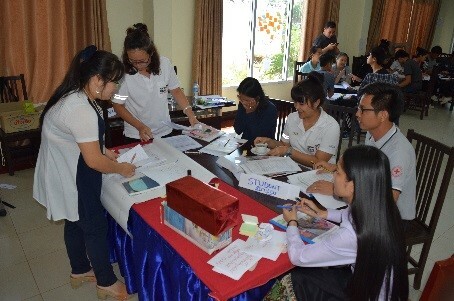 In Laos: Lao RC has conducted a 3-day Youth in School Safety (YSS) training of facilitators from 25-27 July to further enhance the student’s facilitation skills and VCA assessment to come up with needs based mitigation measures. 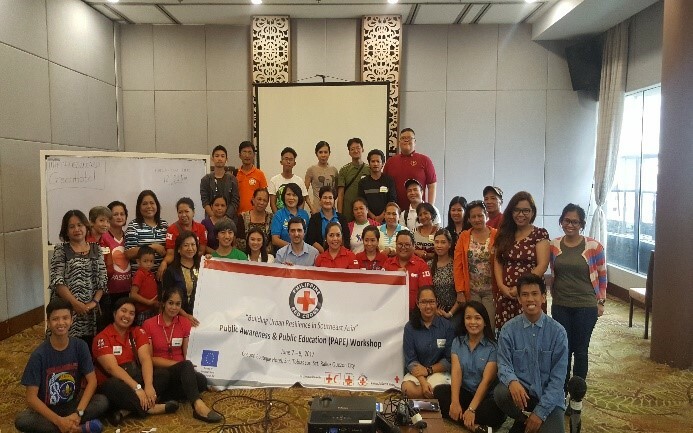 The training attended by 36 participants (23 females) including 5 teachers, 20 students, and Lao Red Cross staff. The training consists of two parts (i) facilitation skills and (ii) demonstration and assessments at their schools to come up with risk informed mitigation planning. Eventually, five school based risk informed mitigation plans were drafted with strong participation of their parents and school teachers including their commitments to providing funding to address some identified risk reduction measures. Read more about the event here. Result 2: Innovative PAPE for disaster risk reduction, targeting specific vulnerable group brings about positive, safer behavior, improved preparedness and social change in five wards of Quy Nhon City, Binh Dinh. In July & August, the GRC, the Binh Dinh chapter, the ward authorities and the volunteers have finalized the preparation of the campaign on the four behaviours related to the risks of fire in households: (i) Being able to appropriately kill fire in households, (ii) Being able to perform appropriately first aid for dealing with burned skins, (iii) calling the right number (and providing the fire brigade with right information when calling), and (iv) evacuating when there is fire. Thus, the design of the key visuals, symbols and icons has been finalized. They will be displayed on billboards, flyers, Tee-shirts and Facebook page. An agreement between the Binh Dinh Chapter and the Binh Dinh fire brigade has been signed to support the communication campaign. The fire brigade participated in the review of scenarios and scripts for theatre events and for key messages for radio programme at ward and hamlet levels. They also provided comments for the design of leaflets demonstrating the four behaviours. The ward authorities have agreed on the dates for their communication campaign activities ((1) Hamlet meetings, (2) broadcasting key messages through Ward’s radio programmes and through mobile loudspeakers, (3) distribution of flyers and display of billboards, (4) theatre performances). A monitoring team has been set up to follow the implementation of the campaign and to gather information (pictures, quotes…) for documenting the PAPE approach in the Urban context of Quy Nhon. A Flashmob in Quy Nhon city on the 20th of August with the participation of 52 young people from 5 wards. The aim was to attract the population interest on the campaign and to invite them to visit the Facebook page which has been setup in July (https://www.facebook.com/dapluaantoan/). The Facebook page displays illustrations on four key behaviors: (i) being able to appropriately extinguish fire in households, (ii) Being able to perform appropriately first aid for dealing with burned skins, (iii) calling the right number (and providing the fire brigade with right information when calling), and (iv) evacuating when there is fire. 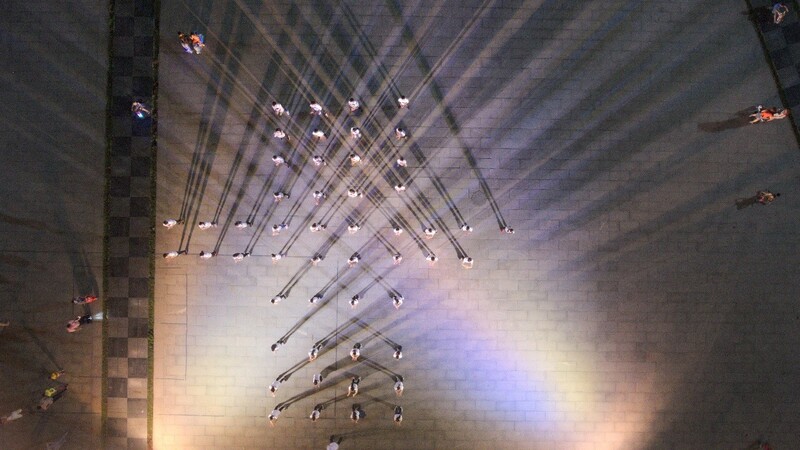 A video of the Flashmob has been posted on the page and has reached nearly 3000 people online since its upload on the 1st September and a total of nearly 6000 people have visited the Facebook page so far. Three project wards organized 15 hamlet’s events and 02 ward’s events (Thị Nại, Nhơn Bình and Ghềnh Ráng). All the events included a Knowledge contest on Fire Safety and theatre plays. The Hamlets‘events attracted a total of around 623 participants mainly families, and the event at ward level about 190 people. The fire brigade and the ward and hamlet authorities were actively involved in each event to judge the theatre performances and distribute prices to the contest participants. More events at ward level are planned in September and similar events in Hải Cảng and Nhơn Phú wards will take place also in September. In parallel, Key messages on Fire Safety were broadcasted through wards’ loudspeakers radio programmes during the whole month. Thị Nại ward also set up 01 mobile loudspeaker team with 25 cyclists including youngsters and elderly persons. Hải Cảng and Nhơn Phú wards will also convey Key messages on Fire Safety through wards’ loudspeakers radio programmes in September. Result 3: Increased capacity of local government authorities and Red Cross for disaster preparedness and response in five wards of Quy Nhon City, Binh Dinh. 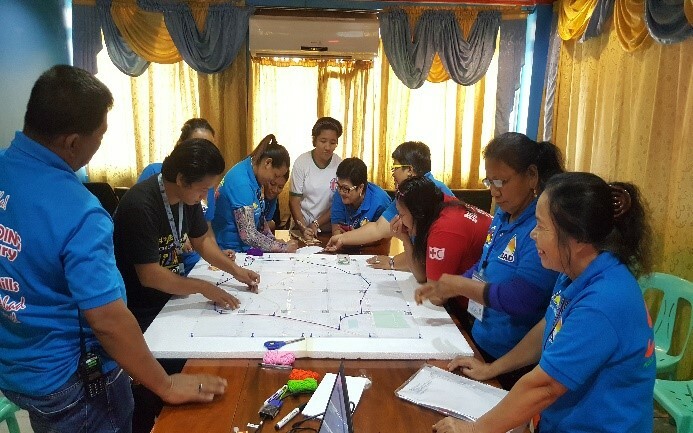 In the 5 targeted wards, by end of June the Technical Support Groups (TSG) have finalized their Disaster Preparedness and Response maps with the methodology developed by the project. In August, they developed the budget and plan for sharing those maps with all the relevant stakeholders from local to national levels. This includes uploading the DPR maps on the DMC’s VinAWARE data base and printing and displaying the maps on the Ward People’s Committee offices and other government and public buildings. The TSGs and the Binh Dinh chapter also prepared the agenda and budget for a Disaster Preparedness and Control planning workshop which took place the 8-9th August. Based on the DPR maps, ward level Disaster Prevention and Control Plans were developed by each ward using the DMC guidelines for planning (2014) and in line with the National CBDRM Programme. Recent work under this project has focused on strengthening the strategy of the project though the implementation of number of trainings related to leadership, disaster management, psychosocial support, fire management and participatory video. Furthermore, there had been clear advances in the completion of the VCA process at school level, as of now six (6) of them are at an advanced stage of revision. In addition, first steps have already been achieved with the identification and setting up of school EWS. Four (4) out of eight (8) proposals had been submitted and discussed with the project team. All in all, the project is progressing according to schedule and continue to be on track toward project completion in December 2017. 1.2.5 Red Cross Youth formation and orientation (for students) and Leadership Development Program (LDP): On August 19 & 20, 2017 another Leadership Development Program was conducted in Batasan Hills National HS. The training was closely coordinated with RCY department (at Chapter level), and was attended by 105 persons (28 male and 77 female). 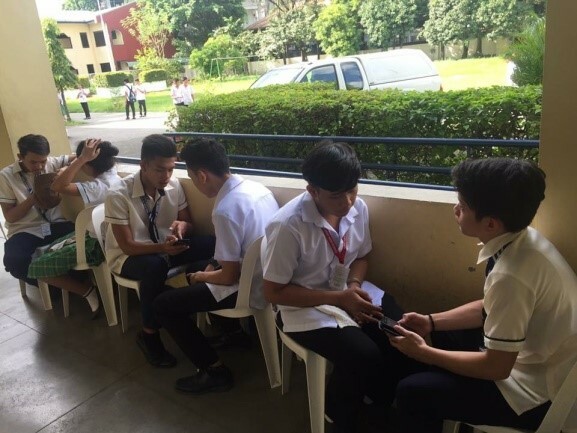 1.2.7 Conduct re-echo sessions with other teachers and students: The procurement for the installation of DRR Corner Bulletin Boards still on process. 1.2.8 Set-up School DRRM Teams and provide further specialized training such as DRR, CCA, health and hygiene promotion, child protection, gender and diversity, etc. : On August 26 & 27, 2017 a specialized training was conducted at Pres. Corazon C. Aquino Elementary School (Brgy. Batasan Hills). It was attended by 76 teaching and non-teaching personnel (14 male and 62 female) and the main topics discussed were disaster management, psychosocial support and fire management. Speakers were invited from PRC and Bureau of Fire. The VCA reports were completed in Bagong Silangan Elementary School (Brgy. Bagong Silangan), Pres. Corazon C. Aquino Elementary School (Brgy. Batasan Hills), Batasan Hills National HS (Brgy. Batasan Hills) and Bagong Silangan (Brgy. Bagong Silangan HS. These reports are currently being reviewed at NHQ (PRC) and all of them are at an advanced stage of revision. Furthermore, Diosdado P Macapagal ES and Dr. Josefa Jara HS (Brgy. Tatalon) VCA reports are been reviewed at Chapter level. Betty-go Belmonte ES and Carlos L. Albert High School´s VCA reports (Brgy. Dona Imelda) are officially finalized and submitted to NHQ (PRC). 1.5.2 Identifying and setting up school early warning system. As for now, 4 out 8 proposals had been submitted to PRC. 1.6.1 Distribution of updated IEC materials: Procurement on process for second batch (new version) is still ongoing and once complete, the distribution will be expedited by September 2017. 2.2.2 Development, reproduction, and distribution of innovative and inclusive PAPE and IEC materials: Brgy. Batasan Hills´s PAPE Activity Plan was finalized by barangay officials and youth representative while the finalization of plan is still ongoing in Brgy. Bagong Silangan. As part of PAPE campaign, on August 16-18, 2017 was conducted a participatory video training in the 4 barangays that was attend by 24 participants. The main goal was to produce new materials for the target group at community level. 3.2.1 Participatory development of risk maps involving representatives on local people, including vulnerable groups, government authorities, and PRC staff. The barangays Batasan Hills and Bagong Silangan are currently in the process of plotting the collected information regarding their risk analysis, infrastructures and capacities. On August 8, 2017, a re- echo session about Quantum Geographic Information System was conducted at Barangay Doña Imelda, attended by 5 representative of Doña Imleda and Tatalon barangays. Continued revision of project outputs, i.e. School Risk Assessment Reports, Community Vulnerability Matrixes, School DRR Plans, Community DRR Plans, etc. Implementation of Dissemination Workshop on Cambodian Law on Disaster Management of DCDM and CCDM, including the districts of Poipet and Svay Chek of Bantaey Meanchey Province. At Regional Level: The 3rd Regional Coordination Meeting hosted by Lao Red Cross in Vientiane, Laos from 11-12 July. The meeting brought all partners of Lao RC, Finnish RC, Spanish RC, German RC and IFRC together to review the project progress and future planning as well as challenges faced vs. solutions. In addition, the meeting has agreed to work on three case studies which are in line with the following themes (i) School Safety; (ii) Public Awareness and Public Education (PAPE); (iii) Behavior Change Communication for DRR; and (iv) Innovative GIS-DPR mapping method. At the end of the meeting, a first draft of case study on PAPE was sketched and additional information as well as its impacts need to be captured during and after PAPE campaigns in all targeted communities. The meeting suggested that a request for extension of two months is needed to enable national societies as well as IFRC to complete all activities. As a result, the IFRC has submitted the request to ECHO and it has been approved for ONE month extension till the end of December 2017. 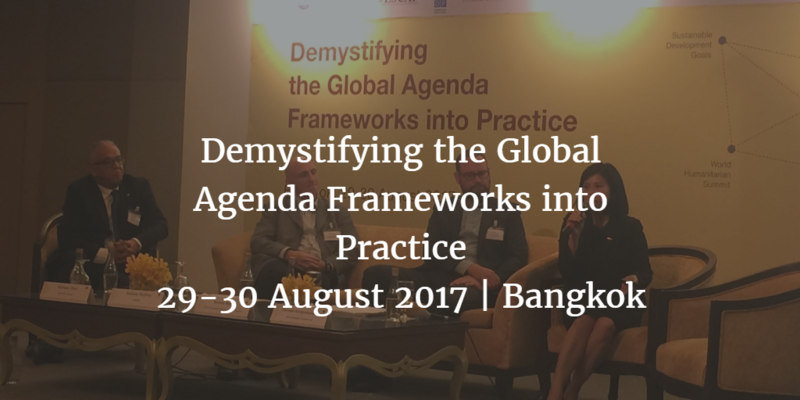 Regional Forum on “Demystifying of the Global Agenda Frameworks into Practice” will take place from 29-30 August 2017 in Bangkok, Thailand. The 2-day Forum aims to identify the challenges, linkages, and potential key entry points for integrating the Sendai Framework for Disaster Risk Reduction, the Sustainable Development Goals, Paris Agreement on Climate Change Adaptation, and the World Humanitarian Summit towards achieving a common goal of making communities resilient to disaster and climate risks in the Asia-Pacific region. 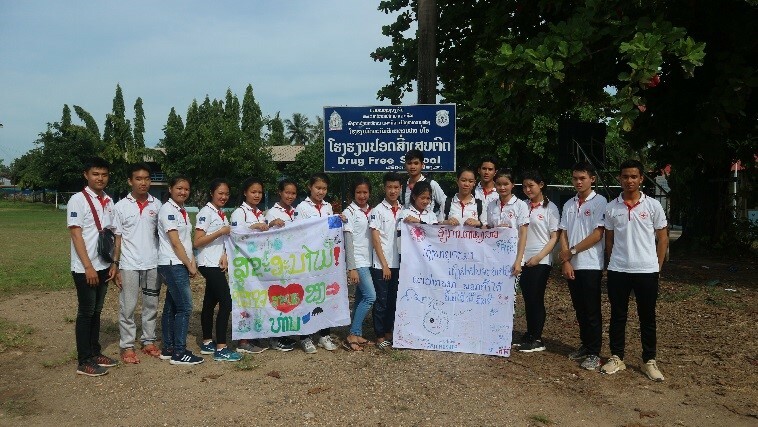 In Laos: Lao RC has conducted a 3-day Youth in School Safety (YSS) training of facilitators from 25-27 July to further enhance the student’s facilitation skills and VCA assessment to come up with needs based mitigation measures. The training attended by 20 participants attended the training. They had a two-day practice and conducted one-day programme in five targeted schools. For more information see the Lao Red Cross Youth in School Safety Facilitators Training. 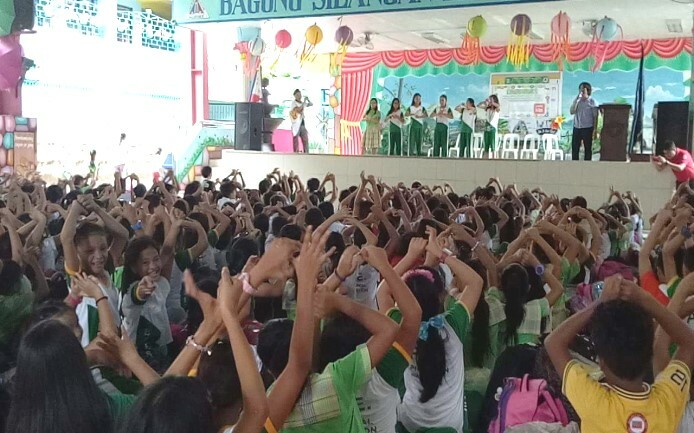 Students from Bagong Silangan ES demonstrating the proper handwashing techniques held last July 7, 2017 at the school. Photo by Philippine Red Cross. A Leadership Development Program was conducted in Pres. 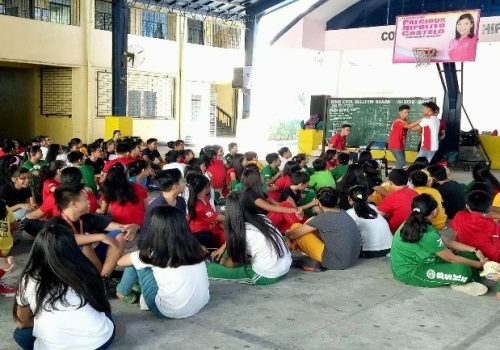 Corazon C. Aquino Elementary School (Batasan Hills) in coordination with the chapter Red Cross Youth, with 26 male and 30 female for total attendees of 56 attendees. Newly recruited School Batang Emergency Response team in Carlos L. Albert High School (Brgy Doña Imelda) conducted refresher course on Junior First Aid held last July 11-14 with 25 male and 47 female for a total of 72 attendees. Distribution of workbook and porsters in Carlos L. Albert High School as teaching IEC materials last July 13, 2017. Photo by Philippine Red Cross. During the month of July, 4 sessions of hygiene promotion and proper hand washing were conducted, and 1 session of hygiene Promotion and HIV Aids prevention education, and 1 session of hygiene promotion and DRR. The sessions were conducted in Brgy Bagong Silangan and Brgy Batasan Hills. VCA process was completed for Bagong Silangan Elementary School (Brgy. Bagong Silangan) and Pres. Corazon C. Aquino Elementary School (Brgy. Batasan Hills). Bagong Silangan ES presented the VCA result to their school teaching personnel. Bagong Silangan HS, Batasan Hills National High School, Betty-go Belmonte Elementary School, Carlos L. Albert HS, Dr, Josefa Jara HS and Diosdado P. Macapagal Elementary School completed the fifth step (reporting). An orientation on School DRRM Manual was conducted in coordination with the School Divisions Office of Quezon City at the Interactive Center, Quezon City Science HS. Two representatives from each target schools were invited as well as one representative from all elementary and high schools in Quezon City. In identifying and setting up school early warning system, discussions were held in each school and proposals were submitted to PRC. While for the provision of first aid kits and minor equipment for training, drills, and simulation exercises, the purchase order is ongoing, the distribution of which is expected by August 2017. Distribution of workbooks and poster was held in Betty-go Belmonte Elementary School, Carlos L. Albert High School, Dr. Josefa Jara High School and Diosdado Macapagal Elementary School. Result 2 – Innovative PAPE for disaster risk reduction, targeting specific vulnerable group brings about positive, safer behavior, improved preparedness and social change in 15 at – risk urban and pre – urban areas in four countries. A consultation session regarding the PAPE workshop outcome was conducted in all Brgys to validate the results and come up with an action plan on the implementation of PAPE in each community. Participants were Brgy officials and representative from different sector such as Persons with Disability, elderly and youth. QGIS Re-Echo Workshop held last July 7, 2017. Brgy staff and volunteer are working on the identification of the critical infrastuctures in their Brgy prior plotting it in the application. Photo by Philippine Red Cross. Result 3 – Increased capacity of local government authorities and Red Cross for disaster preparedness and response in 4 Brgys in Quezon City, The Philippines. After the City Level QGIS Training last April, a re-echo workshop was conducted in Brgy. Batasan Hills and in Brgy. Bagong Silangan. 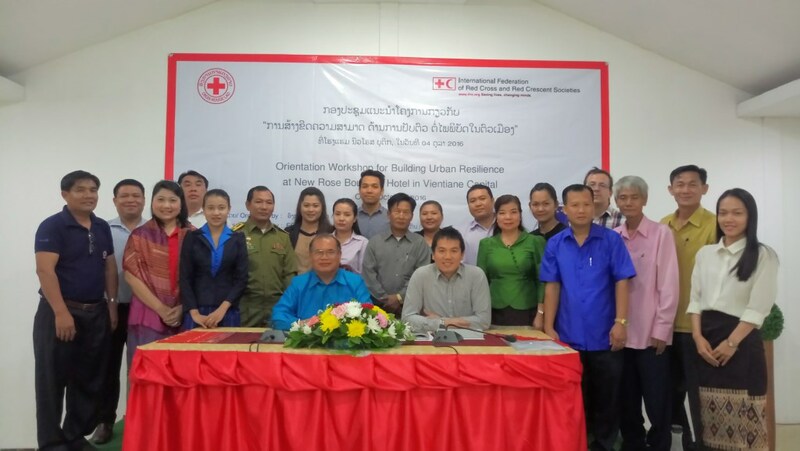 At Regional Level: IFRC has worked with Lao Red Cross to prepare for the 3rd Regional Coordination Meeting which will be taken place in Vientiane, Laos from 11-12 July. The meeting expects to bring all partners (Lao RC, Finnish RC, Spanish RC, German RC and IFRC) together to review the project progress and future planning as well as challenges faced vs. solutions. In addition, the meeting will spend significant time on identification and development of case study based on four themes (i) School Safety; (ii) Public Awareness and Public Education (PAPE); (iii) Behavior Change Communication for DRR; and (iv) Innovative GIS-DPR mapping method. 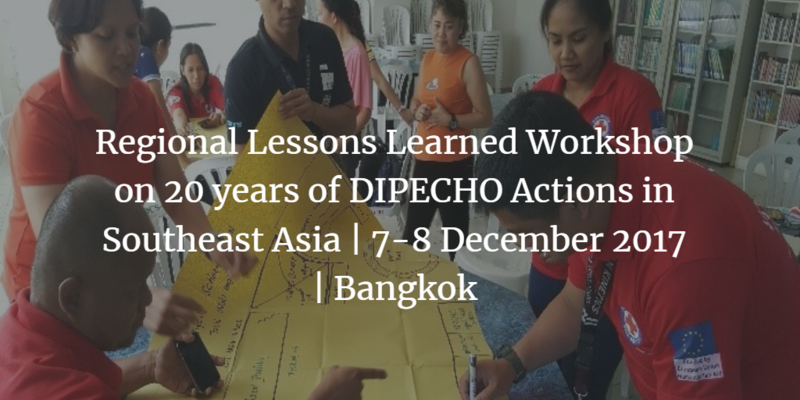 For the research of two decades of DIPECHO contributions to DRR in Southeast Asia, it has move to the third phase out of four phases including three country visits to Cambodia, Indonesia and the Philippines. The visits contained of one day workshop with selective ECHO partners; key informant interviews partners and NDMOs. In addition, several interviews were conducted in June with regional partners such as UNESCAP, UNISDR, ADPC and Oxfam. In Laos: Lao RC has conducted two technical knowledge trainings on DRR, Road Safety, Health and Care including Water and sanitation during the first and second week of June. The trainings aim to further equip participants with solid knowledge on various issue and it will be an add on PAPE campaign design skills to make better impact on campaigns to different groups of people. In addition, a Youth in School Safety (YSS) training of facilitators to be conducted from 24-28 July to further enhance the student’s facilitation skills and VCA assessment to come up with needs based mitigation measures. In Cambodia: the following activities and achievements have been made: ECHO conducted a monitoring visit to Serei Soaphoan, Banteay Meanchey province between 26 and 27 June. The visit was facilitated by Cambodian Red Cross and Finnish Red Cross. Installation of visibility and awareness raising (flood preparedness) signboards in communities and schools. Continued implementation of awareness raising activities in schools and communities by RCYs and RCVs. Sessions focusing on health and DRR (8-9 June). 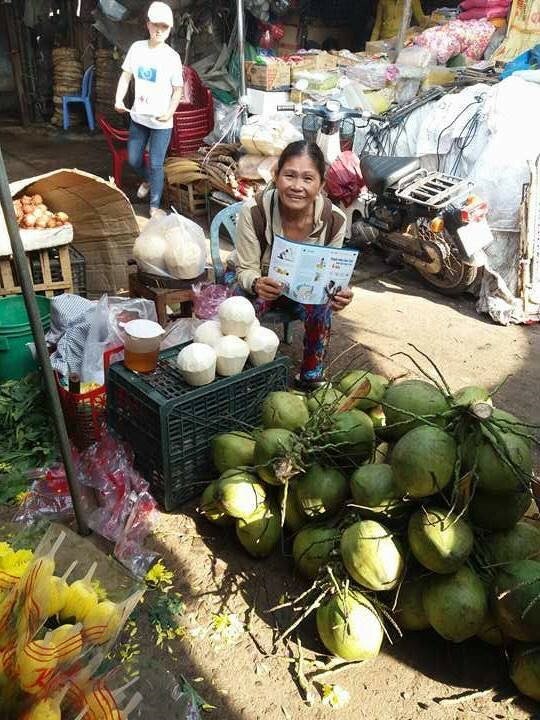 Result 2– Innovative PAPE for disaster risk reduction, targeting specific vulnerable group brings about positive, safer behavior, improved preparedness and social change in five wards of Quy Nhon City, Binh Dinh. The behaviors selected for the campaign are directly related to the risks of fire in households. Each activity will be organized in a way to complement the others activities and in order to implement a comprehensive campaign from July to end of September. Thus, in June an activities timeline has been developed. 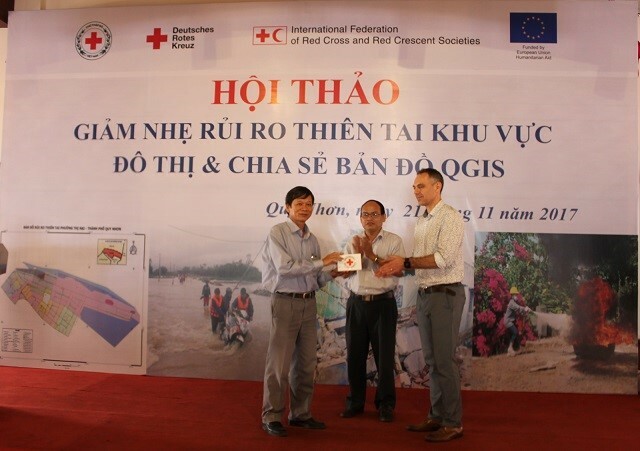 Result 3 – Increased capacity of local government authorities and Red Cross for disaster preparedness and response in five wards of Quy Nhon City, Binh Dinh. In the 5 target wards, the Technical Support Groups (TSG) have finalized their Disaster Preparedness and Response maps with the methodology developed by the project. The maps were developed at hamlet and ward levels and they display information organized in different layers. Those information layers are built on databases which include (1) the capacities in disaster prevention and control, (2) the vulnerabilities and (3) the risks that the community can encounter. In total for the 5 wards (and 39 hamlets) about 660 persons (PwD, children, Hamlet and ward representatives) have been involved in the implementation of the phases 2 and 3 of the methodology. Basic training for Red Cross Volunteers (RCV) and Youth (RCY), and school teachers on DRR, first aid, and road safety in 8 targeted schools in Quezon City and repeat sessions with other teachers and students were conducted; School DRR and Management Teams (School DRRM Teams) were set up. Conduct, review or update comprehensive hazard, risk, vulnerability and capacity assessments for each of the 8 targeted urban schools (school risk assessments). School DRR Plan, a School DRRM Plan, and/or a Fire Evacuation Plan for 8 selected urban schools were drafted in Quezon City this includes setting up school early warning. Result 2 – Innovative PAPE for disaster risk reduction, targeting specific vulnerable group brings about positive, safer behavior, improved preparedness and social change in 15 at – risk urban and pre – urban areas in four countries. City level training workshops were organized to share the results of the baseline KAP surveys with local government authorities, National Society NHQ and city staff, design and develop PAPE for DRR in the urban contexts, and train selected RCY and RCV on PAPE strategies and skills in the urban context. At Regional Level: A meeting between ECHO and IFRC has been conducted to provide progress updates of the project in various countries and discuss about the remaining activities toward the end of the project. The discussion resulted in an agreement that if extension is needed to complete all committed activities, notification to ECHO should be sent as soon as possible. On this note, IFRC will be thoroughly discussing with the partner national societies during the third coordination meeting which is scheduled during the second week of July in Vientiane, then final decision will be made. ECHO also articulated their expectations that the project interventions should be able to show tangible outcomes at the end of the project, something is different and unique in comparison to other “traditional” initiatives. In the meantime, ECHO expressed its willingness to conduct M&E visits to our project sites in conjunction with other partners, so it would be appreciated if we could propose something in Cambodia and Laos between mid-June to mid-July. In this connection, a project site visit to Bantey Meanchey, Cambodia has been under arrangement where three schools are to be visited on 26 June with the support of the Finnish RC and Cambodian RC. In relation to the case study identification and development, the IFRC has initially discussed and agreed with the partner national societies on the process by collating as much information as possible then to bring them to Vientiane during the third coordination meeting to further interrogate and shape them up from there. For the research of two decades of DIPECHO contributions to DRR in South-East Asia, it has move to the third phase out of four phases including three country visits to Cambodia, Indonesia and the Philippines. The visits contained of one day workshop with selective ECHO partners; key informant interviews partners and NDMOs. This process is crucial to identify good practices, key challenges, gaps and recommendations under each thematic area. There are six thematic areas identified including (i) Disaster preparedness and response; (ii) DRR in Education Sector; (iii) Innovation and appropriate technology; (iv) Institutional embedment/mainstreaming of DRR into policies; (v) Consortium Mechanism; and (vi) Advocacy and public awareness. In Laos: Lao RC has updated its workplan from May to October 2017 in which the focus will be on conducting technical knowledge trainings on DRR, Road Safety, Health and Care including Water and sanitation during the first and second week of June. The trainings aim to further equip participants with solid knowledge on various issue and it will be an add on PAPE campaign design skills to make better impact on campaigns to different groups of people. In addition, a Youth in School Safety (YSS) training of facilitators to be conducted in July to further enhance the student’s facilitation skills and VCA assessment to come up with needs-based mitigation measures. Result 1– Children and youth are more resilient to disasters and have a safe and secure learning environment in 8 urban public schools in the Philippines, through improved Red Cross contributions to the ASEAN Safe School Initiative (ASSI). 617 participants (437 female and 180 male) were provided with simultaneous orientation sessions during their In-Service Training (INSET). The training covers the following topics (i) Mass Casualty Incident; (ii) SBDRRM (Relief & PSP); (iii) Fire Prevention & Management; (iv) First Aid; (v) Early Warning System; and (vi) Evacuation. In addition, four out of eight schools have conducted VCA process to define common hazards, risk factor and capacity to inform the school leaders of school-based DRR plan in which recommendations toward risk reduction measures/interventions are highlighted. From the assessments and reports that fire evacuation plan and early warning enhancement are likely prioritized in urban context. In this connection, meetings were conducted with the focal teachers regarding the Early Warning System in the targeted schools with the aim to review the concept of early warning system, in order to prepare them to create/improve existing EWS in their schools. 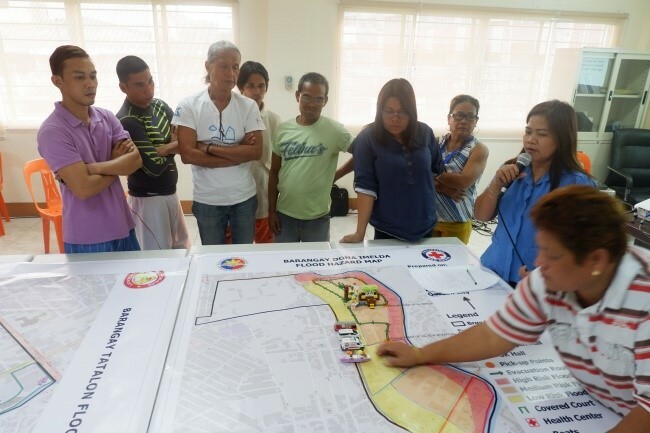 Result 2– Innovative PAPE for disaster risk reduction, targeting specific vulnerable group brings about positive, safer behaviour, improved preparedness and social change in four at-risk urban and pre-urban areas in the Philippines. A PAPE KAP Survey was carried out in four Barangays from 2-10 May with a total of 1,200 respondents (400 in each Barangay). The process was facilitated by ten 10 RCs’ 143 volunteers from each barangay. Two barangays from District II are in the process of completing VCA Process. In District IV, VCA reports are still for finalization. In addition, Focus Group Discussions (FGDs) for the inclusion of Vulnerable Groups in the Mapping process were conducted in Dona Imelda and Tatalon with participation of 50 elders (33 F and 17 M); 15 PWDs (8 F and 7 M) and 44 Youths (28 F and 16 M). In order to strengthen RC143 DM Teams and First Aid and Safety Teams, procurement of first aid kits and minor equipment is still ongoing. Delivery is estimated by July 2017. 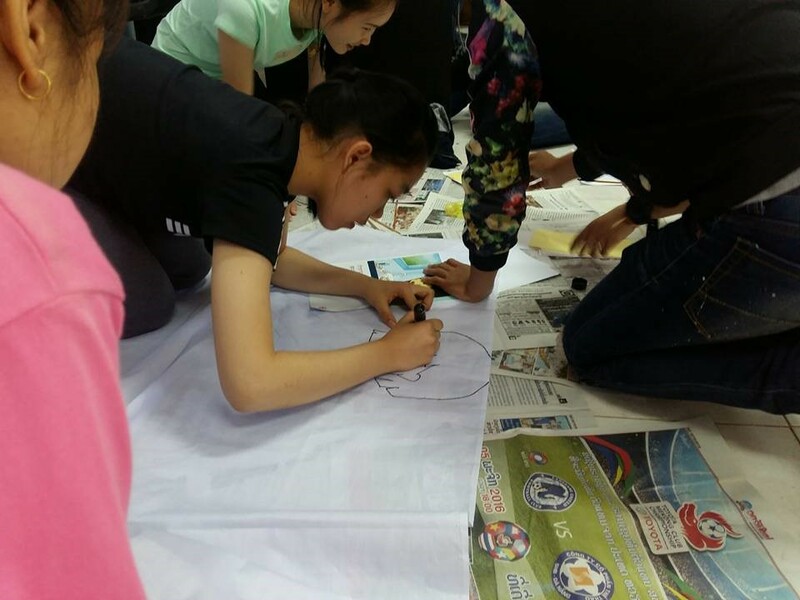 The youth group is working on the slogan for the target audience – the youth in the campaign. In Viet Nam: Between 13-14 May, an additional workshop in Quy Nhon to finalize the design of the PAPE campaign was conducted. The workshop was attended by 37 people (18 females and 19 males, including three GRC facilitators) and contributed to the design of the campaign). This includes staff of the People’s Committee, heads of hamlet, Ward Red Cross, Youth Union, inhabitants from the five wards and 2 members of the fire brigade. The workshop was supported by an expert in behavioral change communication (BCC) and also a teacher in RMIT University in Hanoi (Royal Melbourne Institute of Technology). She provided advises on the design of the campaign. The cost of her involvements has been shouldered by another GRC project. The behaviors selected for the campaign are directly related to the risks of fire in households: (i) being able to appropriately kill fire in households, (ii) being able to perform appropriately first aid for dealing with burned skins, (iii) calling the right number (and providing the fire brigade with right information when calling), and (iv) evacuating when there is fire. – have understood the planning steps of a campaign and are able to create a communication plan for future communication campaigns. – have planned for the communication campaign for their wards and city in order to improve knowledge, attitudes and to change the behavior of the population for fire prevention. The campaign will focus on two main target audience: (i) the middle-aged (30-50 years old) and (ii) the youth (16-25 years old). For each target audience, based on their motivational characteristics for changing behaviors and on their preferred channels of communication, the workshop participants have developed slogan, key visuals and campaign activities plans. For the youth audience, the campaign activities will include (i) setting up a Facebook page, (ii) organizing a Flash mob to attract attention on the campaign, (iii) organizing a short movie contest, and (iv) organizing theatre performances. For the middle-aged audience, the activities will include (i) hamlet meetings, (ii) broadcasting key messages through Ward’s radio programmes (including songs), (iii) distribution of flyers and display of billboards, (iv) broadcasting key messages through mobile loudspeakers. Each activity will be organized in a way to complement the others activities and in order to implement a comprehensive campaign from June to September. For instance, the Facebook page will be the main mean to inform the youth of the flash mob, the movie contest and the theatre events. Moreover, the Facebook page will also be used for collecting and sharing the movies produced by local youth and for presenting to the young audience the information displayed on the flyers. For the middle-aged audience, while the hamlet meetings will be the opportunity to distribute flyers and quiz, and theatre performances will also be organized aiming at attracting a larger audience. Also during May, GRC and VNRC were collecting quotations from the designers to finalize the key visuals, symbols and icons which will be displayed on the billboards, flyers, t-shirts and Facebook page. As the Facebook page will have to be jointly managed by an administration team composed of five young people from five wards, one young representative from VNRC chapter, the GRC project officer, GRC/VNRC is also currently considering the opportunity to involve one to two student volunteers from the RMIT University Communication Department. Those students could provide technical and advisory support to the Facebook Administration team. In terms of progress under Result 3, in the five targeted wards, the Technical Support Groups (TSG) have carried out the initial phase and the second phase of the mapping methodology. The VNRC chapter has signed a volunteer agreement with five students of the University of Quy Nhon in Master’s Degree in QGIS. They have conducted the monitoring of the QGIS mapping phases using the monitoring form developed by the consultants (COMICs). The mapping is expected to finished by mid-June for all the five wards. GRC Project Officer has also conducted monitoring and gathered information for the development of a case study. Implementation of 3rd FRC monitoring visit from 23 April to 4 May; including visits to all target schools and communities; and facilitation of internal (FRC procedure) project risk management analysis. Result 2– Innovative PAPE for disaster risk reduction, targeting specific vulnerable group, brings about positive, safer behavior, improved preparedness and social change in two Sangkats in Serei Saophoan in Cambodia. Result 3 – Increased capacity of local government authorities and Red Cross for disaster preparedness and response in three Sangkets of Serei Saophoan in Cambodia. Due to the communal elections, activities in the project are reduced and implemented in a very low profile. However, it is not expected that the elections will seriously affect the project’s timeframe. At Regional Level: The regular Skype Meeting for all 4 countries was held on 20 April 2017 and the study plan of ECHO 20 years research has been finalized and agreed by the European Commission’s Humanitarian Aid Department (ECHO) and International Federation of Red Cross and Red Crescent Society (IFRC) in Bangkok, including the data collection plan. The consultant will start to collect the primary data in 3 selected countries; Cambodia, Philippines and Indonesia during 1-20 May 2017. 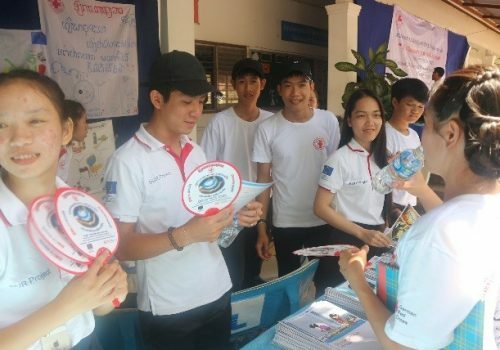 In Lao PDR: The national workshop on Public Awareness and Public Education (PAPE): a guide and key message in Vientiane Capital City was conducted for 5 target schools with 90 students and 5 teachers including Lao Red Cross’ staffs on 1 and 2 and 8 and 9 April 2017. The objective of this workshop was to train the students (Red Cross Volunteers) about the guide and tools and key messages of public awareness and public education for disaster risk reduction, health and hygiene promotion in terms of developing Information, Education and Communication (IEC) materials. In the Philippines: The training on multi-risk maps using QGIS (Quantum Geographical Information System) was conducted during 24-26 April 2017 in Quezon City, Manila. 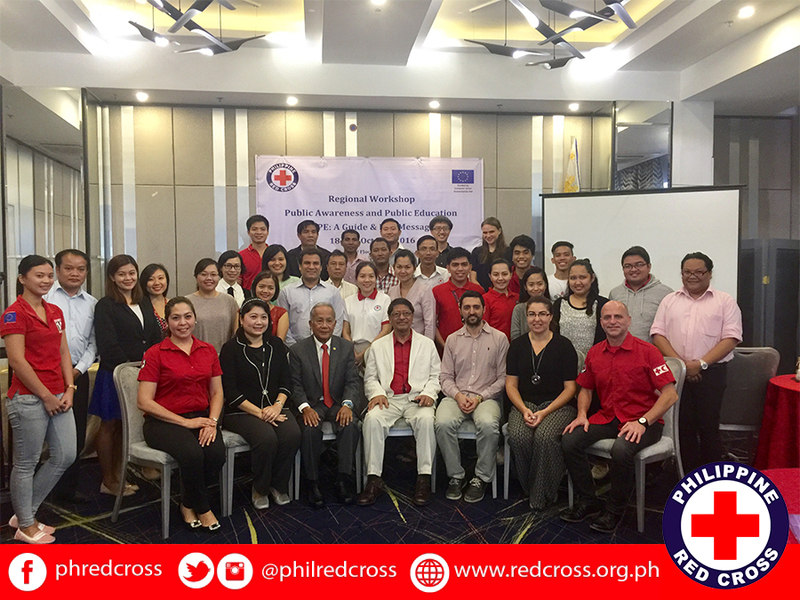 This training was facilitated by three Philippines Red Cross (PRC) staff and the Singapore Red Cross (SRC) Delegate, with a total of 17 participants from Barangay Batasan Hills, Barangay Bagong Silangan, Barangay Tatalon, and Barangay Dona Imelda. Besides, the Knowledge, Attitude and Practice (KAP) survey questionnaires for the communities were translated and encoded in Open Data Kit (ODK) program and a mock survey creation was organized on 20-21 April 2017 within the 4 Barangays of District 2 and 4, with 5 respondents each. Prior to the interviews, Purok leaders from the Barangays and PRC staff and volunteers were orientated about the survey. In Vietnam: The Public Awareness and Public Education (PAPE) workshop was held in Quy Nhon during 20 – 22 April 2017. It aimed at planning the communication campaign based on the results of the Knowledge Attitude and Practice (KAP) survey and on qualitative research (Focus Group Discussions (FGDs) and in-depth interviews). The sessions of the workshop included (i) an introduction of project’s objective, project indicators and related activities, (ii) the presentation of the results from research on Knowledge-Attitude-Behavior and (iii) a detailed description of the Planning Process. The behaviours selected for the campaign are directly related to the risks of fire in households: (i) Being able to appropriately kill fire in households, (ii) being able to perform appropriately first aid for dealing with burned skin, (iii) calling the right number (and providing the fire brigade with the right information when calling), and (iv) evacuating when there is fire. At the regional level: The Regional Team Meeting for all four countries was held in Hanoi on 24 March 2017 and the key discussions were about the review and revision on the 6-month plan of action including the progress update and challenges on the project implementation. In the Philippines: As of March 2017, Philippine Red Cross (PRC) and the schools had conducted the Earthquake Drill last 3 March 2017 during the AM session of classes. Mr. Rick Castillo from Quezon City Disaster Risk Reduction Management Office (QCDRRMO) was the evaluator. 3,089 Female and 2,913 Male, totalling 7,002 students with 240 teaching personnel participated. Information, Education and Communication (IEC) Learning materials (board games, flipcharts, posters and workbooks) for the schools were already delivered to PRC. 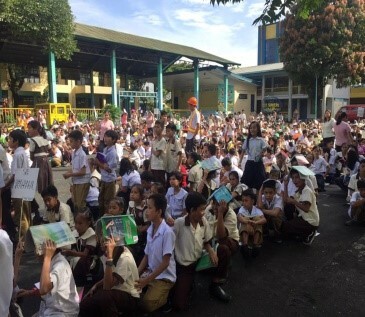 IEC materials were also distributed to the eight target schools: Five Disaster Risk Reduction (DRR) flip charts and five board games for each school. In Vietnam: From 21 to 23 March in Hanoi took place the regional training on Quantitative Geographical Information System (QGIS) on the new QGIS methodology. 34 people participated to the event from which 18 were trainees and 16 observers and supporters. Seven trainees were from Viet Nam Red Cross Society (VNRC) headquarters (three males and four females) and nine were from Myanmar, Philippines, Lao PDR and Cambodia National Societies and from Partner National Societies (PNS) (Spanish and Finnish) (three males and six females), two were from PNSs from Viet Nam (American Red Cross and German Red Cross) (1 male and 1 female). Observers and supporters were from VNRC, local Technical Support Group (TSGs) from 2 wards of Quy Nhon, and from PNSs/IFRC based in Viet Nam and in South-East Asia (9 males and 7 females). The training included formal and practical sessions on laptop to learn the basic skills to develop base maps and to upload data using QGIS. In Lao PDR: The Knowledge, Attitude and Practices (KAP) survey final report was finalized and shared to the project team at the end of March. The project had been doing document preparation for the national workshop on Public Awareness and Public Education (PAPE): a guide and key message in Vientiane Capital City and there was a meeting with the project team on organizing the workshop. To design the PAPE workshop, the project team coordinated with the five target schools the project team had a meeting . The objective of this workshop was to train the students (Red Cross Volunteers – RCVs) about the guild and key message of public awareness and public education for disaster risk reduction in term of developing the IEC materials. At the regional level: The preparation meeting with the Partner National Societies (PNSs) and Lao Red Cross (LRC) on the quantitative geographical information system (QGIS) pre-workshop tasks was held on 17 February 2017 via Skype and all participants agreed to prepare the information as required. 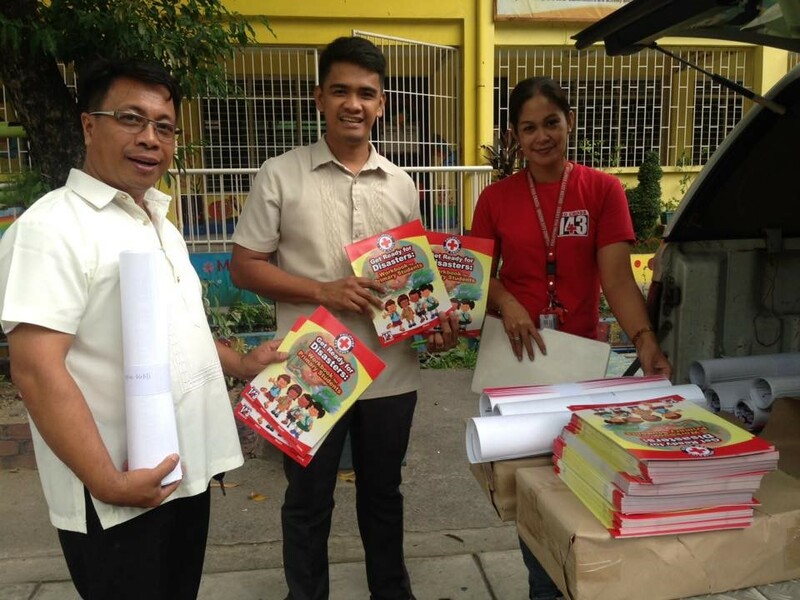 In the Philippines: As of February 2017, Information, Education, Communication (IEC) learning materials (board games, flipcharts, posters and workbooks) for the schools were being already delivered to Philippine Red Cross (PRC). Distribution in the schools started in the first week of March. A coordination meeting with Plan international (moved up project) was conducted last 7 February to plan out coordination on the same covered areas. A workshop was conducted on 28 February and was participated by all staff to share, and distinguish activities were conducted to complement and avoid duplications in terms of Redevelopment and Realignment Manual (BRRM), which is contingency and action plans of Barangay. PRC also attended Technical Working Group (TWG) meeting last 7 February, initiated by Quezon City’s Deployment of Pasay Disaster Risk Reduction Management Office (QCDRRMO) and other stakeholders, PRC shared the activity output of Public Awareness and Public Education (PAPE) workshop and asked for insight/ comment of the TWG. 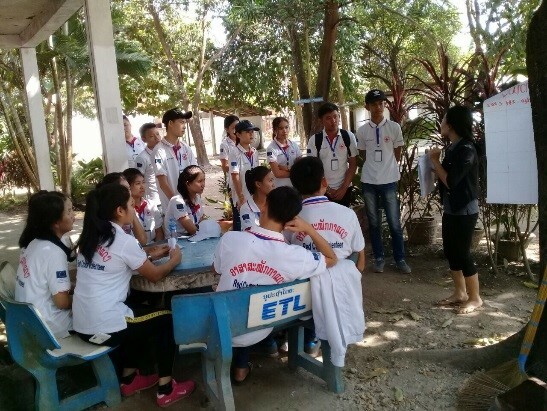 In Cambodia: The three school risk assessment exercises wereconducted with the active participation of Red Cross Youth (RCY) and RCY Advisors, with the support of Cambodian Red Cross (CRC) project staff. By the end of the reporting period, the risk assessment reports were in the process of being finalized. After the finalization, they will be presented and validated with the respective schools and authorities. In Vietnam: On 22 February to 3 March in Quy Nhon taken place the training on the new QGIS methodology. 25 wards authorities’ members of their Technical Support Group learned and put in practice the new methodology during this 8-day training. The training included formal and practical sessions on laptop to learn the basic skills to develop base maps and to upload data using QGIS. Practical sessions also provided the opportunity to learn the process to collect data from the population in a gender-sensitive and participatory way. In Lao PDR: The National workshop on Knowledge, Attitude and Practices (KAP) survey result sharing in Vientiane Capital City was conducted on 21 February 2017 in order to share the results of KAP survey to all stakeholders which consisted of government agencies and NGOs who work on disaster risk reduction. More than 40 people including teachers and students from five schools participated in this meeting to better understand the community knowledge in the target areas of the project and this KAP survey aimed to be determined as baseline data of the project and could create project activities. 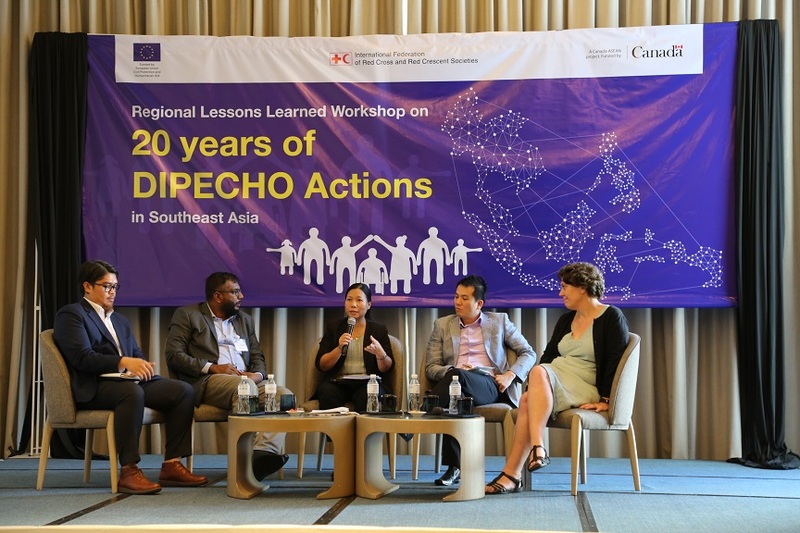 At Regional Level: The recruitment process of the regional consultant for the study on two decades of DIPECHO contributions in South East Asia was completed – The successful candidates from ADPC were on board in early of January. The consultation meeting among ECHO global DRR Coordinator, Regional Project Manager and the consultants team was held on 11 January 2017 in order to discuss the research methodology and expectations of this study. In the Philippines: As of January 2017, two schools have restructured their existing school DRR team (Pres. Corazon C. Aquino Elementary School and Carlos Albert High School), whereas Bagong Silangan High School, Betty-Go Belmonte Elementary School and Diosdado Macapagal Elementary School are still forming their DRR teams. In order to prepare for the Plan of Action for the Public Awareness and Public Education (PAPE) tool in the community, the team conducted a city-level PAPE workshop on 31 January 2017 in the Quezon City DRR Management Office premises. Representatives from the Communications Department, Quezon City DRRMO, Environmental and Sanitation Department participated in this activity. • In Cambodia: Progress in the implementation of PAPE Knowledge Attitude and Practices (KAP) survey centred on the development of the survey questionnaire. 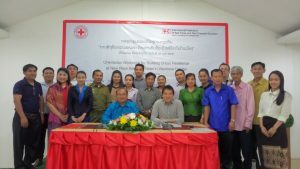 The definition of the survey’s target population and methodology, and the training of Cambodia Red Cross personnel in the development and implementation of PAPE-related initiatives were completed. The Cambodian Red Cross staffs were trained in PAPE and Behavioural Change Communication, while the survey questionnaire was prepared and transferred to MAGPI. • In Vietnam: The new QGIS mapping methodology was developed in a way it can supplement CBDRA and VCA and maximize the use of DPR mapping for DRM planning and for Damage and Need Assessment at ward level. Thus, GRC and VNRC following the recommendation of the DMC Deputy Director decided that it was relevant to organize a first training in Quy Nhon for Technical Support Group (TSG) members at ward level to refresh their knowledge on the CBDRA approach and the linkage between CBDRA and DRM planning. A 3-day training was held on 6-8 January 2017, and contributed to enhance the TSGs understanding about the principles for gender mainstreaming in CBDRA and DRM planning, and about the concepts of vulnerability and disability. In Lao: The National Orientation Workshop on KAP Baseline survey was held on 14 January 2017 for 85 students from 5 schools in Vientiane Capital City. It aimed to provide the common understanding on hazards and disasters in the local context and to understand the questionnaires and simulation exercise. The survey objective was to determine baseline data to develop project activities and also to use it to be comparative with the endline survey at the end of the project to measure improvement of the knowledge/awareness and behaviour of people in the communities. At the regional level: The recruitment process of the regional consultant for studying two decades of ECHO contribution in South East Asia has been completed. The successful candidate will be on board in the beginning of January. In the Philippines: ECHO regional coordinator for Disaster Risk Reduction (DRR) proposed the project site in Quezon City on 6-7 December. The teams are organizing the activity and inviting the primary key partners involved like the QCDRRMO, Barangays and Department of Education. Besides, the national PAPE Workshop was conducted among 143 Red Cross focal teachers on 6 December 2016 at Philippines Red Cross Social Hall and was attended by RC 143 focal teachers from district 2 and 5 in Barangay. It was a multi-sectoral approach. The focus of the said workshop is to have concrete and strong “key messages” which promote safety of children in schools and in their homes and the community. In Cambodia: The draft of the PAPE KAP survey, and Survey Implementation Plan (including identification of target population) was finalized. The final draft of the PAPE KAP survey was pending results from the community’s VCAs. There was implementation of the school risk assessment in three public high schools making use of the adapted VCA tools. The final draft of the project communication and visibility plan was presented to Cambodian RC Management for endorsement. The main general key messages were identified – to be shared with ECHO Bangkok. In Vietnam: The draft questionnaire for the KAP survey was shared with PAPE national consultant for consultation. She added and revised some questions to get the information related to communication issues. The training on PAPE was held in Quy Nhon from 16 to 18 December 2016.It was co-facilitated by the national consultant, and GRC and VNRC project officers who previously participated in the Regional PAPE training in Manila. In Laos: The project team coordinated with the Vientiane City branch in order to appoint the district coordinator for implementing the project activities. The target areas in five communities were identified and the team agreed to divided into two clusters including Risk and Hazard in urban and peri-urban, i.e. disaster, road safety, health and hygiene promotion. Besides, the team agreed to hire a KAP consultant to conduct KAP survey in Vientiane capital city. Refresher sessions on first aid already started in Batasan Hills National High School (BHNHS) last Oct. 25-26, 2016, with 500 participants. 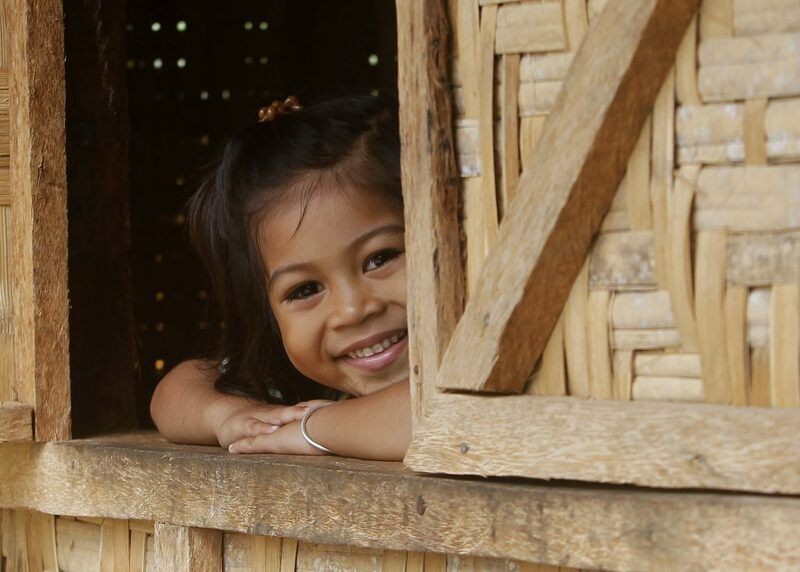 At Regional Level: KAP survey questionnaires for schools in Cambodia and the Philippines are being finalized, with a view to align the KAP survey questionnaires for communities in all four countries. the recruitment process of a regional consultant for the study on two decades of ECHO contributions in Southeast Asia is underway. In the Philippines: In District 2, refresher sessions on first aid already started in Batasan Hills National High School (BHNHS) last Oct. 25-26, 2016, with 500 participants. In District 4, a Focal Teacher’s workshop to plan-out the session activities for their co-teachers and students was conducted, with 17 attendees (12 females, 5 males). 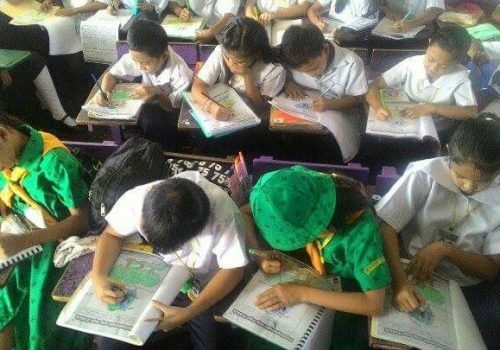 In Cambodia: Schools KAP survey in 3 targeted schools in Serei Soaphoan has been conducted. The total of 224 surveys were conducted by 21 Red Cross Volunteers (RCVs). However due to technical difficulties in the data transfer of incomplete questionnaires, only 189 questionnaires were processed by the mobile application (85% of target). Baseline analysis will be done on the basis of those results, as it is not possible to redo the 35 pending questionnaires because it is exam period in schools and both RCVs and respondents are not available. On 23 November, Finnish Red Cross and Philippine Red Cross presented in the Cities for All Conference in Phnom Penh. The conference was organized by People in Need (an ECHO partner in Cambodia). In Viet Nam: The PAPE training package has been adapted to the Vietnam context, which includes a draft package, agenda and training contents in Vietnamese, which have been shared with GRC and VNRC focal points. In November, several working meetings among partners staff trained in the PAPE Regional training in Manila. In addition, the consultant has adapted the IFRC PAPE guidelines and messages. 3 target groups have been identified for the awareness campaign which will focus on flood/storm and on fire risks: (i) the general population of the 5 wards, (ii) the households living in temporary shelters, and (iii) the small businesses. KAP questionnaires and sampling strategy have been designed by GRC and shared with implementing partners. In the Philippines: The activities for this month focused on strengthening and building capacity to the chapter based Red Cross Volunteers (RCV) and conducting training to the focal teachers and students, with the main purpose to increase the level of awareness, skill and knowledge of the volunteers and RC 143 focal teachers in terms of disaster preparedness, managing and retention of Red Cross Youth (RCY) volunteers in the schools and eventually response in any emergency cases when the need arises. In Cambodia: Second technical support visit was conducted by Finnish RC, Cambodian RC Head of Disaster Preparedness, and IFRC Project Coordinator. The visit was highlighted by discussions on technical implementation and financial management. On 7 October, a briefing was conducted to ECHO Bangkok Representatives visiting Cambodia. In Viet Nam: Launching Workshop of the “Building Urban Resilience” project was conducted in Quy Nhon City by Mr. Tran Sy Pha, Vice Director of the VNRC Disaster Management Department on the 15 -16th October 2016. The workshop was attended by 38 participants from Ward, City and Provincial authorities, schools and VNRC and German RC staff. Project staff and stakeholders have gained knowledge about the project objectives and indicators, and an implementation plan has been drafted. Finalization of contractual arrangements between GRC and VNRC: signature of the project agreement by VNRC leadership on the second week of October. Appointment of the VNRC Project Management Unit (PMU) at Headquarters and in Binh Dinh chapter. 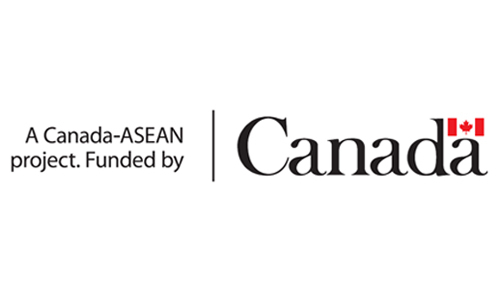 At regional level: The regional project profile including 4 targeted countries has been published and distributed to program countries (Cambodia, Philippines and Lao PDR). The project agreements among IFRC and Spanish, German, Finnish and Lao Red Cross have been signed and completed the first payment to all PNSs. A regional public awareness and public education workshop will be held on 18-20 Oct, 2016 in Manila. A consultant on Behavior Communication for Change has been recruited to facilitate and design, together with two co-facilitators from the Philippine Red Cross ,the appropriate tools and session for participants. In Lao PDR: The project team has developed the Details Implementation Plan (DIP) and prepared as well as coordinated with stakeholders to organize the Project Kick Off Meeting in country on 4 October 2016. 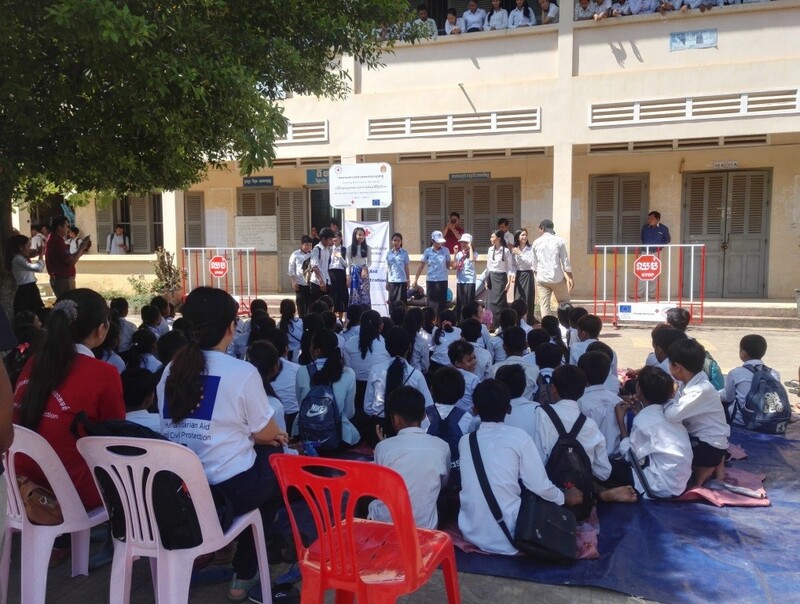 In Cambodia: The team organized RCY and RCV groups in schools and communities, and conducted the initiation of activities in Schools – orientation and trainings for RCVs and RCYs (Red Cross Movement and First Aid), by coordinating with District and Provincial Authorities in Bantaey Meanchey and Serei Soaphoan. In Viet Nam: a consultant was hired to support GRC/VNRC in the development a training package about public awareness and public education adapted to Vietnam, and to design communication campaign. The selection of the five implementation wards in Quy Nhon City has been conducted. The selection involved a national consultant, GRC, VNRC chapter staffs and ward authorities’ representatives. A consultancy team for the development of the GIS Disaster Preparedness Mapping methodology has been recruited in August: the team consists in two experts in Community Based DRR and two experts in GIS mapping who previously supported the national DMC (Disaster Management Committee). 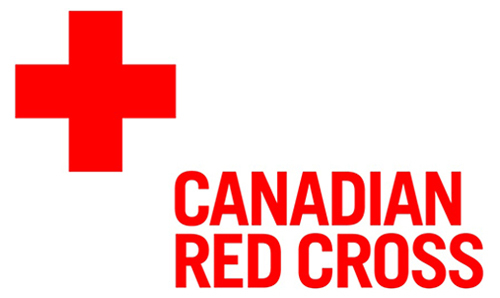 The International Federation of Red Cross and Red Crescent Societies, in partnership with Finish, German and Spanish Red Cross societies, brings to the project extensive experience in school safety, public awareness and public education and risk mapping, with strength in regional sharing and learning, and peer support. The workshop went well with 30 participants from the National Societies of Viet Nam, Cambodia, Laos, Myanmar and Philippines including the Red Cross Youth and Red Cross Volunteers in Quezon Chapter who implemented the project in the Philippines. The workshop was facilitated by team members from IFRC Bangkok CCST, IFRC Viet Nam Country Office, Spanish and Philippine Red Cross, and Red Cross Red Crescent Climate Center. In addition, the Philippine RC General Secretary delivered the opening remarks with the Chairman of Quezon Chapter to all participants and hoped that the participants can enhance their knowledge and skills on the public awareness and public education especially in urban context and share their experiences to each other as peer-to-peer approach. 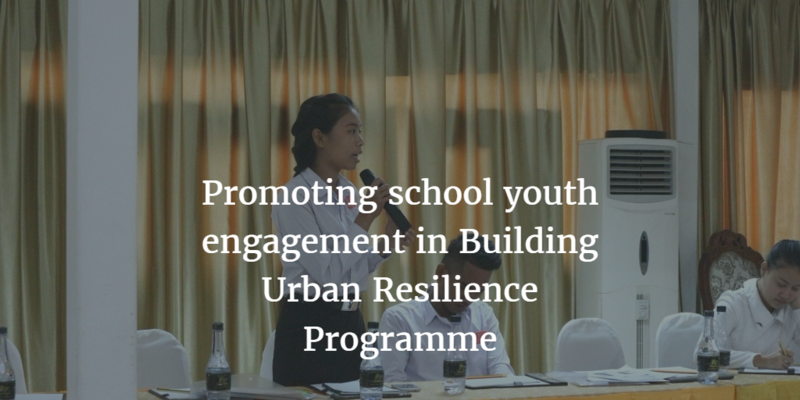 In Vientiane, Lao PDR, the national kick-off meeting of Building Urban Resilience Project was conducted on 4 October 2016. This meeting was started with the project overview at regional and national level. Participants came from the French Red Cross, Vientiane Capital Red Cross branch, Ministry of Labour and Social Welfare, Ministry of Education and Sport, Ministry of Human Resources and Environment, Care International and target schools. The project team shared the project implementation plans and opened session for discussions and comments from participants.